After conquering my bout with walking pneumonia which began on Auguest 24th I felt ready to hike again. 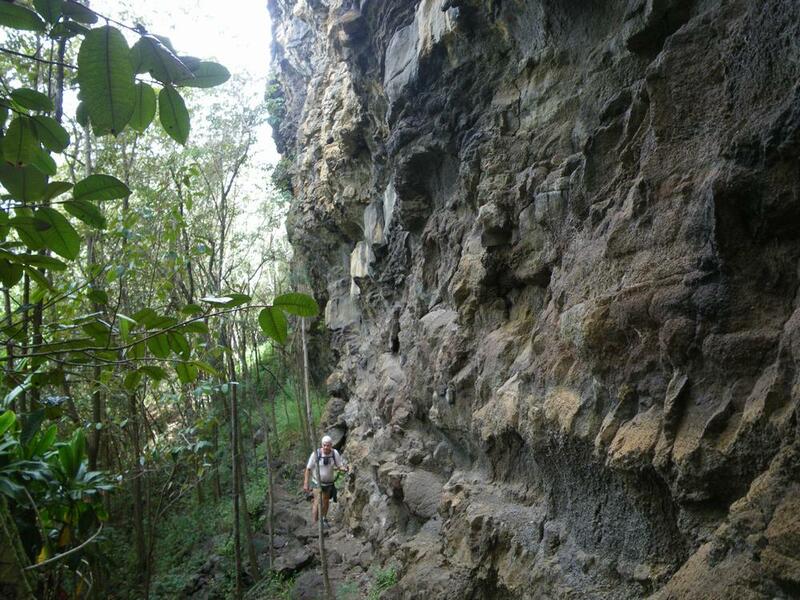 Dan and I would check out the Lualualei Lookout Loop which is pretty easy and is also the first 1/4 of the Wai`anae Ramble hike which the Hawaiian Trail and Mountain Club would be hiking in early Oct.
We began walking about 930 and reached Jury's Tree in about 1 hour. A little slower than usual, but we were in no rush. After a 10 minute break we turnied right on the Ramble Trail and headed for the look out. We've done this so many time that we took few pictures. Here is one of Dan coming along under the big rock face just before we topped out on the ridge. Once upon the ridge between Wai`anae and Lualualei Valleys I took this picture looking west toward the ocean. It's a panoram so use the scroll arrows to see all of it.